Film makers and fans gathered at the Innovation Underground this weekend to celebrate the newest addition to the growing list of film festivals in Texas. The inaugural Downtown Bryan Film Festival was produced by recent A&M Consolidated High School (AMCHS) alumni. The event featured the work of recent high school and university graduates. Class of 2012 alumni Kent Juliff and Madeline Packard created the Downtown Bryan Film Festival, a new annual summer film event. They hope to showcase short-films by AMCHS audio video production alumni as they continue to advance in their careers. While film festivals in Texas are not uncommon, the students believe focusing on hometown filmmakers and those early in their careers will add to the growing film and arts activity in downtown Bryan. 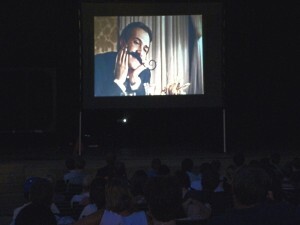 Mustachio by Stephen Gamache was among the films featured at the festival. This year the festival showcased 10 short films by alumni who have studied, or plan to study, film production at universities across the country. Founders hope to expand on the program next year and engage even more local film makers. Downtown Bryan Film Festival is not the first film festival in the area. Red Wasp will celebrate its 10th year this October, making it among the longer standing events on the Governor’s list of more than 50 film festivals in Texas. Festivals and events are powerful tools for community and economic development. Film festivals in particular represent a great opportunity as they serve to bolster the states growing film industry, generating high quality jobs and economic activity associated with film production as well as subsequent tourism opportunities. To learn more about film making in Texas, visit the Texas Film Commission web site. The festival was sponsored by Advent GX, Buffalo Wild Wings, Copy Corner and Downtown Bryan Association. To learn more, visit the festival web site.